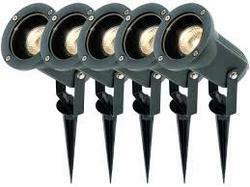 With the constant support of our dexterous crew of professionals, we are fulfilling the varied requirements of clients by offering optimum quality Garden Lights And Spikes. These lights are manufactured using optimum grade components and modular machines in compliance with set industry norms. Further, these lights are stringently checked on different quality parameters before being dealt to our clients assuring their flawless finish standard at user’ end. We “Unicom Power Projects” situated at Noida (Uttar Pradesh, India) have gained recognition in the field of manufacturing and supplying broad array of Electrical Panels, Power Cables, Meter Boxes, Generating Sets, Electric Transformers, Bus Ducts, Junction Boxes, Lightning Arrestors, Internal And External Lightnings, Chemical Earthing Systems, Rising Mains, Solar Power Plants and Cable Trays. Under the supervision of our proprietor, “Mr. Praveen Sharma,” we have been successfully catering the diverse requirements of various industries. Established in the year 2004, we are backed by huge infrastructural base that encompasses various divisions such as procuring, production, quality testing, R & D, sales & marketing and transport & logistics. All these divisions are outfitted with requisite facilities needed to maintain streamline production. We also provide Electrical Design Consultancy Services rendered by our highly experienced experts. Besides, our easy payment modes, client-centric approach and ethical business policies have enabled us to gain some of the projects like Swarn Ganga Housing Society Ltd. Ghaziabad (U.P.) , Sr. Citizen Home Complex welfare Society, Peach Tree Commercial Complex Gurgaon Haryana, Aadi Entertainment Pvt. Ltd. Rewari Haryana, Park View Apartments Gurgaon Haryana, Jaipuria Sunrise Indira Puram Ghaziabad (U.P. ), etc.